You have a stored procedure named Procedure1. Procedure1 retrieves all order ids after a specific date. The rows for Procedure1 are not sorted. Procedure1 has a single parameter named Parameter1. Parameter1 uses the varchar type and is configured to pass the specific date to Procedure1. A database administrator discovers that OrderDate is not being compared correctly to Parameter1 after the data type of the column is changed to datetime. - The code must NOT use aliases. - The code must NOT use object delimiters. - The objects called in Procedure1 must be able to be resolved by all users. 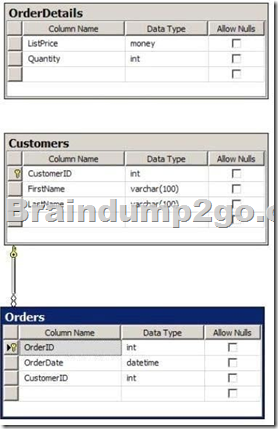 - OrderDate must be compared to Parameter1 after the data type of Parameter1 is changed to datetime. - Displays the details of only students from Canada. - Allows insertion of details of only students from Canada. and the searched CASE expression is used when it's full or bulk logged.